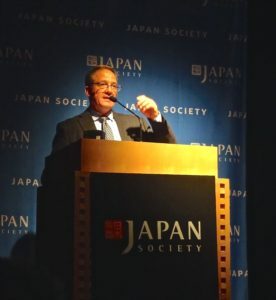 “Where is the sake industry today?” Sake World editor and our host John Gauntner asked the audience at the sold-out event at the Japan Society. 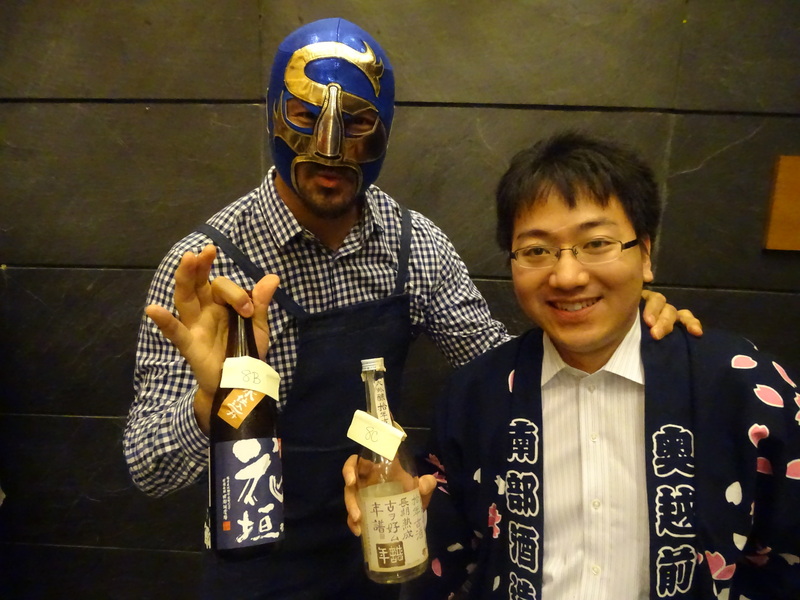 A charismatic figure, with a shock of gray hair, he is the official sake ambassador to the U.S. Since its inception twenty years ago, John Gauntner has dutifully hosted the annual sake event at the Japan Society, covering a range of themes and bringing award-winning chefs like David Bouley and Japanese pottery expert Robert Yellin. 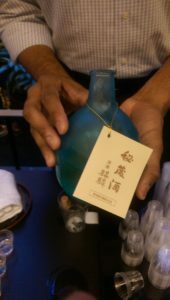 Gauntner said the in the 1990s, New York had just a couple of shops that had a decent range of sake; however, today the city has embraced Japanese rice wine. Tasting events such as these at the Japan Society, speciality shops such as Sakaya in the East Village and the rise in trendy, authentic Japanese gastropubs, or izakayas, and ramen-yas have boosted sake popularity. 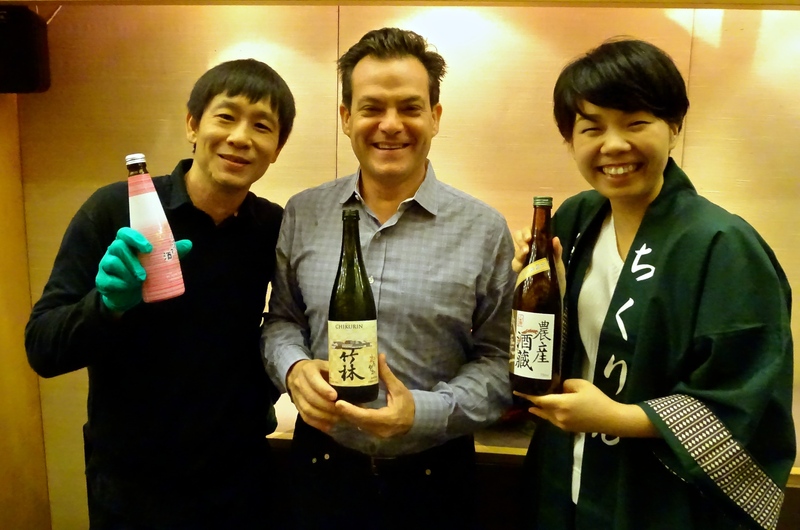 Distributors as well as sommeliers, according to Gauntner, are taking sake very seriously, meticulously pairing it with non-Japanese dishes. On average, according to Gauntner, consumption in the U.S. grows 10% a year, with around 5,000 kiloliters imported from Japan. Both a combination of tasting events such as this and the explosion of authentic trendy Japanese restaurants such as ramen-yas and gastropubs, or izakayas that dot New York City have helped boost sake’s popularity. 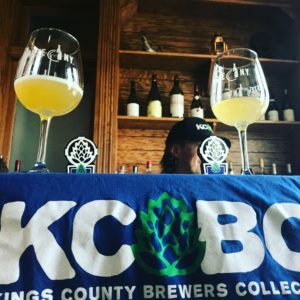 Finally, craft sake breweries like Brooklyn Kura, one of 15 in America, with the help of the industry in Japan have also begun to take off. While hot house sake, or atsukan, still enjoys a special place in our hearts, New Yorkers now enjoy an incredible range of different sakes including sparkling to aniseedy premium drinks. 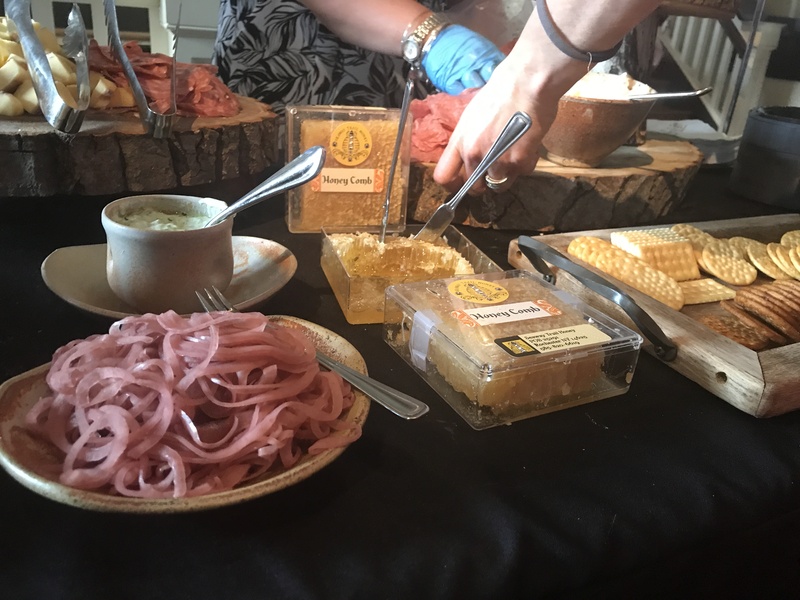 At the tasting, reps happily bantered with patrons, hopping from table to table and clammering to sample the goods. 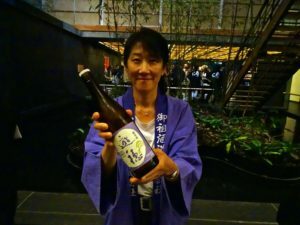 There were the reputable big names such as Dassai 23 and the award-winning Kirin Hizou Shu Daiginjo, neighboring the more modest Shichida Junmai Daiginjo by Tenzan Brewing. 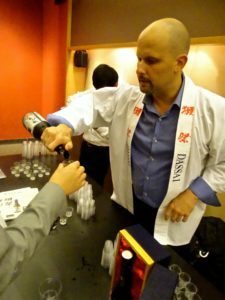 While sake’s popularity in the West, particularly the United States, has grown to a roughly 30%-share of the export market, it has had an adverse effect in Japan. Mr. Gauntner said that since 1998, Japanese consumption of sake has dwindled with many sake producers going under. Since 1997, about 586 breweries in Japan have disappeared. Oddly while production is down to almost 60% since the end of the 20th century, the number of sake pubs and high end premium sake have spiked. The paradoxical relationship between the success and demise of the sake industry stems from poor local demand and rising foreign interest. Too often viewed as old person’s drink, many younger Japanese are drinking far less these days. Meanwhile rice-producing regions near Sendai are still contending with the fallout from the Fukushima disaster of 2011. Even with the success of its export market, Mr. Gauntner said, the breweries cannot only rely on it. Those who frequent izakayas after work know that there will always be cheap sake, but the different varieties that one should also enjoy may differ from one region to another. Surprisingly, there were quite a lot of aged vintage sake, or koshu at this tasting event. Once a rarity, koshu has made its own niche in the market. Unlike red wines, aged sake’s value may not appreciate in monetarily but these vintage brews certainly pack a massive punch of flavor. Tentaka’s vintage 1989 had deep, bold dry-sherry notes with a long finish. I particularly liked the 10-year Hanagaki Daiginjo Koshu and 2013 Shousetsu Junmai Daiginjo, simply because I found their flavors more accessible. 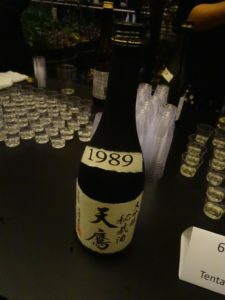 The 1997 amber Okonomtasu Tokubetsu Junmaiginjo and Hoyo 1984 from Uchigasaki Shuzoten had an intense whiskey-like characteristic, which also had a pleasant fragrance. While all were very enjoyable, they may not be for everyone’s taste. Though sake consumption in Japan has waned, John Gauntner remarked that perhaps its trendy appeal in the West, in cities like New York, will finally rekindle the Japanese love for this underrated beverage. 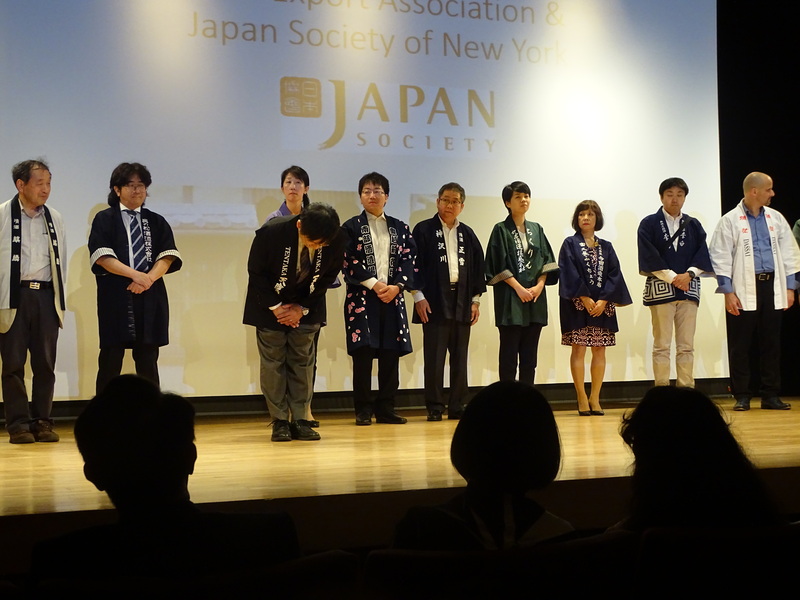 For more information on upcoming events, visit the Japan Society. 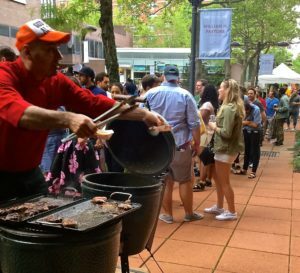 “This smell of grilled meat, the burger, this is the United States: summer is coming and that’s all that I need,” Asher told me, a 28-year old New Yorker. 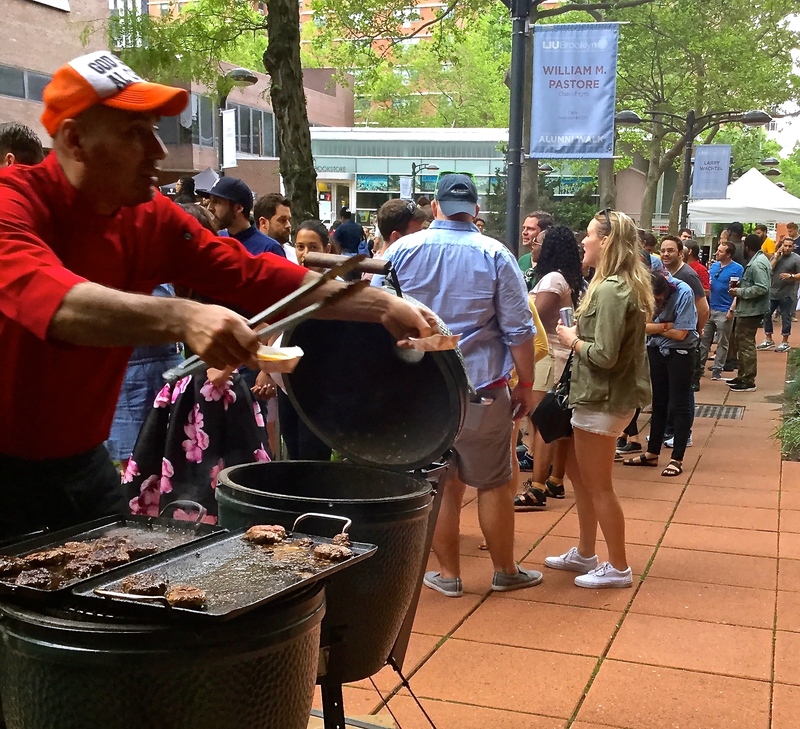 It was a relaxed atmosphere at The Great Brooklyn Grill Out during Memorial Day weekend, with everyone waiting for summer and wondering why spring never showed. The sun played hide-and-seek throughout the afternoon and the rain held off. All of these sentiments, surrounded by the echo of laughter from the children playing and a backdrop of drumming and guitars, mixed with the smell of barbecue on a Saturday afternoon. One could wander at their leisure among the dozens of stands in the garden of the Food Sciences Academy outdoor pavilion at Long Island University in Brooklyn. 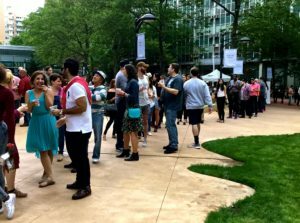 People lined up at each booth, most seeming to be in good moods at this first annual event, with a glass of beer, punch, or whiskey in hand (water bottles were also available). Some relished the chance to play the passing food critic, speaking to their line-mates about what they had tasted and what looked suitable for future consumption. It didn’t seem that folks stumbled across this event by chance: no tourists here, but rather gourmands and food festival veterans. 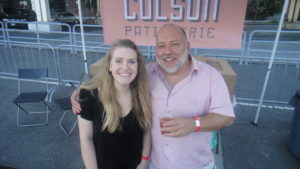 Most had heard of or knew in some capacity the organizer of the festival: Jimmy Carbone, a NYC-based restaurateur and social entrepreneur who created Food Karma Projects, which creates unique events like this one. 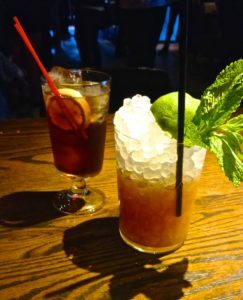 Many found themselves wandering over to the jovial young man serving a whiskey cocktail garnished with a chili-ginger lime. It looks and tastes like iced tea but proceed with caution! 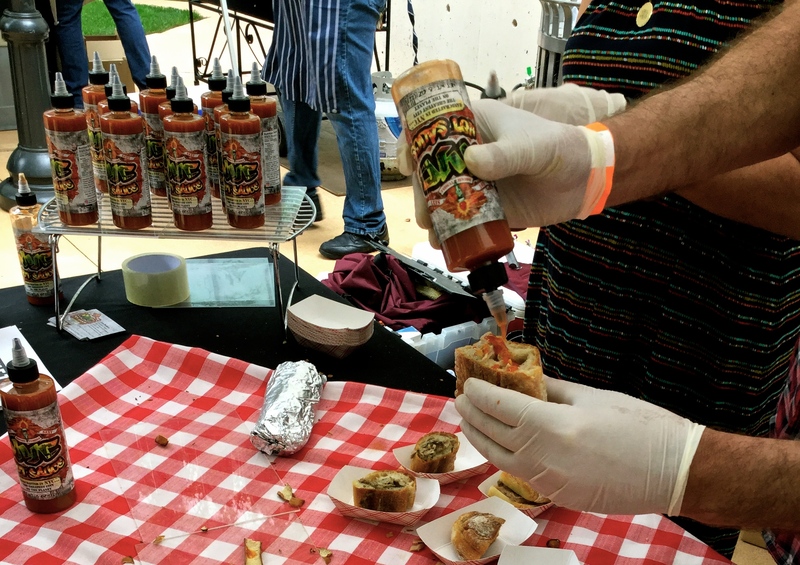 What better way to accompany a barbecue than with a good hot sauce? Some would say that this is an essential part of any barbecue. 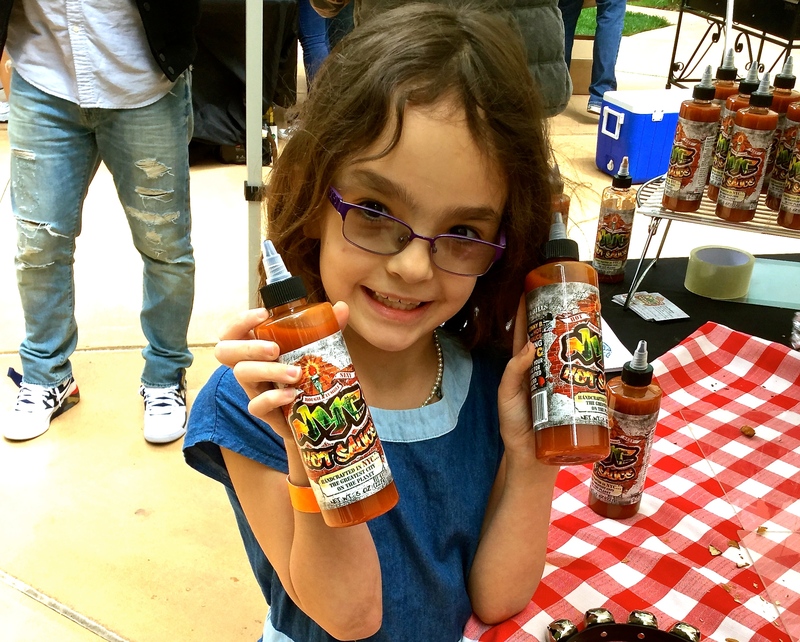 Jon Brattons presented his hot sauce alongside his wife and daughter. Jon says that we can use his hot sauce with eggs, French fries, meats, sandwiches and basically whatever you may prefer. 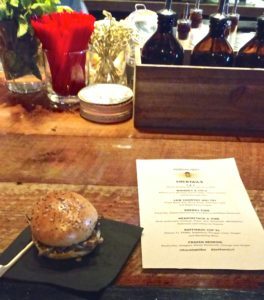 They use the freshest and most local of New York ingredients. Their sauce is very flavorful and his words describe his passion for sauce, meat, and New York. This event is here to ensure that the public enjoys, tastes, and discovers good new products. However, according to Jon, “If someone wants to buy, I won’t refuse to publicize this sauce and make some money”. Passion is a very important word in this festival. The lovely people manning the stands were enthusiastic and knowledgeable, even the ones dishing out water and chips. There were also the famous hamburgers of George Motz, a known burger gourmand. The burger-lovers at this festival (and there were many) were familiar with this chef and willing to wait two hours to eat his burger. A wonderful discovery indeed: some things are worth the wait. Unfortunately, if you showed up towards the end, there was little left to saveur and many booths ran empty (except the beer and liquor stands: people, rejoice!). For information on upcoming events, visit Food Karma Projects. 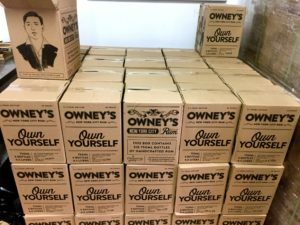 Have you ever seen the Taste of New York Stores that have locations all around New York State? I notice it every time I go to Grand Central. When I have a second to stop in, I realize I only go to a select few wines that I’ve tasted at vineyards up north and am clueless when it comes anything else. Governor Cuomo had a solution for customers like me. 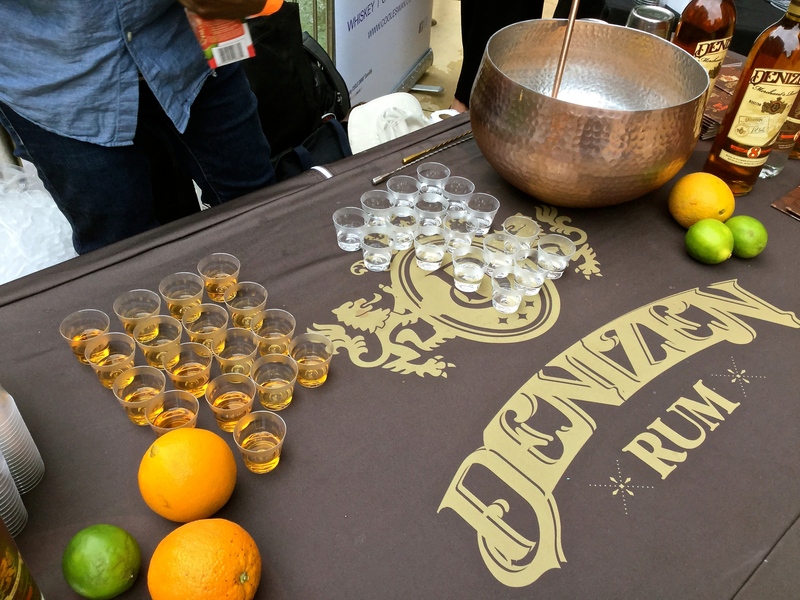 To encourage purchases from local farms and distillers, he created the first-ever Taste NY Experience an event that took place on May 24th at Pier A in Battery Park. This is an ongoing initiative to support the economic growth and tourism for NY state for the state and showcased 50 of New York State’s craft producers of spirits, beer, wine, and cider. 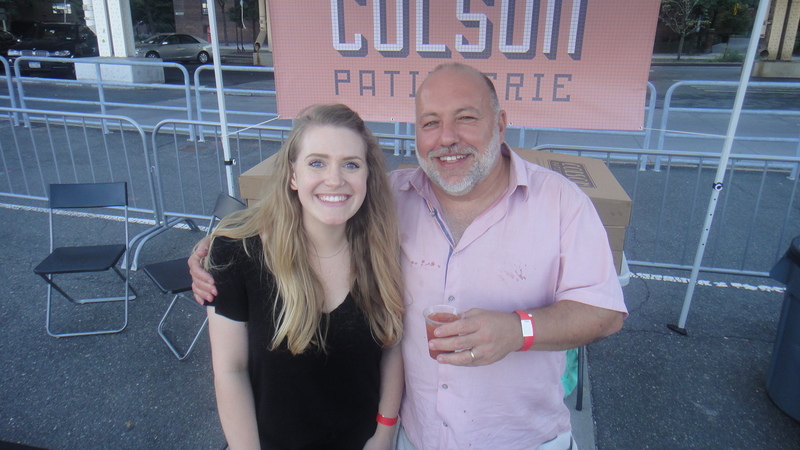 I met many artisanal producers representing 10 distilleries, 13 breweries, 18 wineries and 9 cideries from the Empire State including: legendary bar The Dead Rabbit, Finger Lakes Distilling, Brooklyn’s New York Distilling Company, Shmaltz Brewing, Yonkers Brewing, Brooklyn’s Brooklyn Winery, Dr. Konstantin Frank, Brooklyn’s Brooklyn Cider House and way too much more. Food to soak up the booze included: Brooklyn’s Anomaly Season (unconventional kimchi, e.g., apple, beet, blueberry), New York’s Chobani Yogurt, and Cabot Creamery. 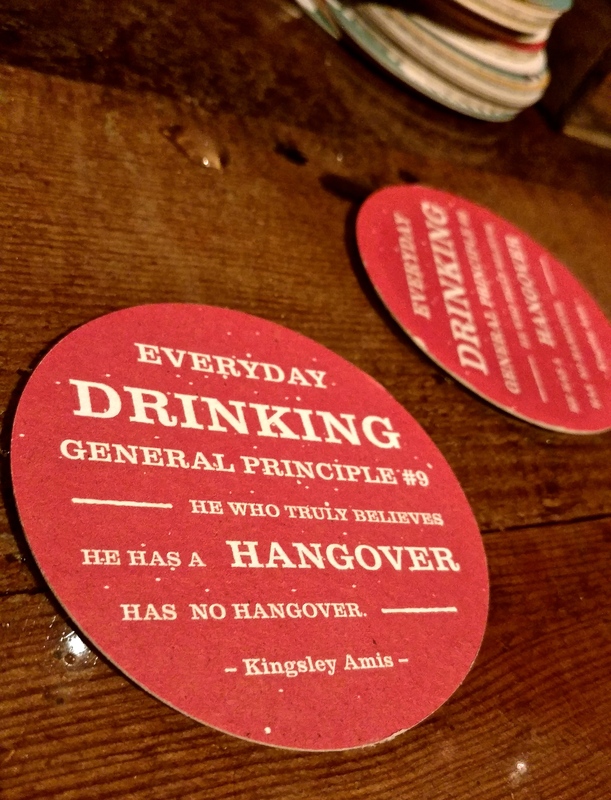 My plus one and I decided to plan out our journey…Wine first, spirits second, cider third, and then top it off with a few cold beers… Sounds good right? 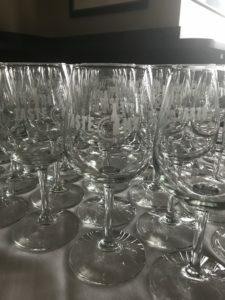 So, I grabbed my engraved Taste of NY glass and sampled the wines. 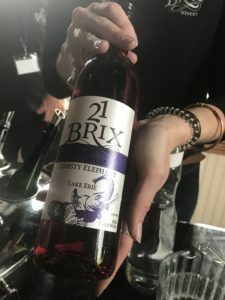 I first meet Lakewood Vineyards in the Finger Lakes and enjoyed a glass of their Bubby Candeo, and swiftly moved on to Dr. Konstantin Frank – which I am a huge fan of since I had their Dry Riesling at the Culinary Institute of America. I was so excited to try their bubbly Chateau Frank Brut, which did not disappoint! 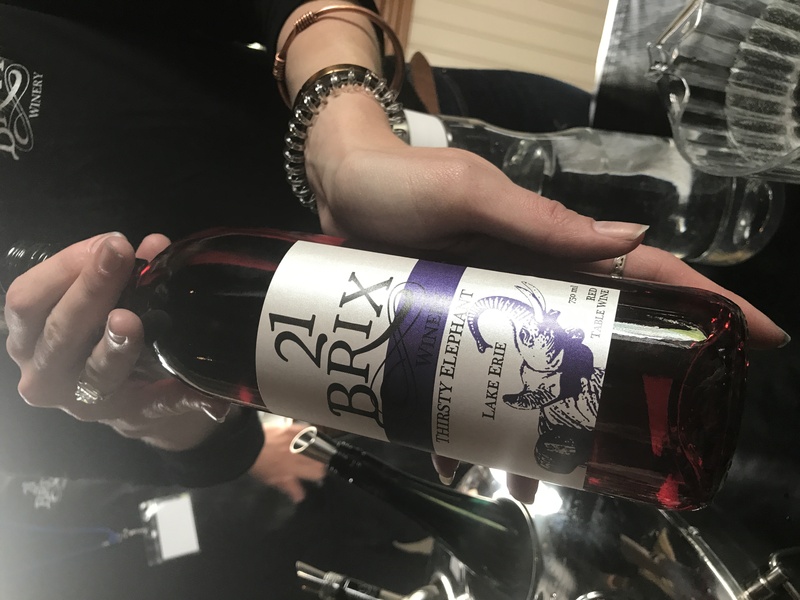 From there, I had Johnson Estate’s dessert wine, Pinot Grigio from Wagner Vineyard, and Thirsty Elephant wine from 21 Brix which was phenomenal (and pink). I had a lovely conversation with the owner of Anthony Road Winery and the how generational the winery is and how they allow the younger generation to have some ownership by giving them design control of the labels. Hemann J. Weimer’s Dry Riesling was AMAZING, and the guy behind the table knew which bottle to introduce me to without saying a peep. After, I tried some spirits. 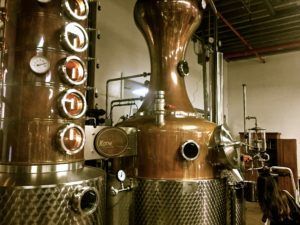 I had to go to the New York Distilling Co., because — well duh– who makes a better gin than Alan Katz? 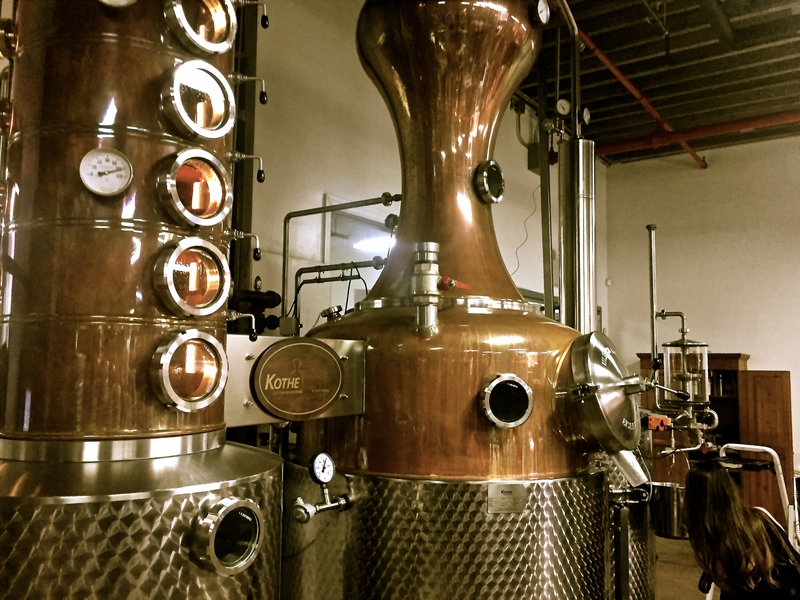 I actually tried the Queen’s Courage gin that is only made at the distillery. That gin could make any gin hater fall in love. Next up, Five & 20 Spirits, which had both rye and bourbon. I was very surprised that I enjoyed the rye over bourbon which is my favorite thing ever. The Finger Lakes Distilling had their McKenzie Whiskeys and mixed us up some enjoyable Manhattans with it in the back. For ciders, I tried the Brooklyn Cider House, Eve’s Cider, and South Hill Cider. They were all good. The South Hill Cider brewery owner Steve Selin explained the consistency of the product and the about how some apple seasons are rough – especially last year. I tried his Pomme Sur Lie which is dry and still, and crisp! 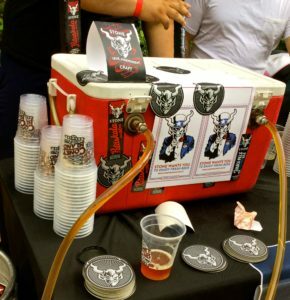 When I got to the beer, I went for the Yonkers Brewery and tried a few of their brews that I was not quite familiar with. From there I tried some Kings County Brewers Collectives brews, had Ithaca Beer’s famous flower power IPA. I met great brewers such as Abandon Brewing Co, who was so passionate about his beer and brewed a great Saison– might I add. I was awfully surprised that one of my last beer was so delicious. It was the Community Beer Works beer, which I was not expecting to like since it was that color brown that I know it isn’t my favorite. It was so crisp and delicious. Amazing NY-based foods were also featured. I had kimachi blueberries, which were delightful. Chobani had yogurt drinks that were Pina Colada flavored. All sorts of cheese were on display from cheese curds to bleu cheese and gouda. Mercer’S Wine Ice Cream paired nicely with the drinks and the product that JUST launched that weekend – totally unique. I was able of sample some of Bruce Cost’s famous ginger ale and Red Jacket Fuji Apple helped us take a break from the rough job of sampling. I’ve been meaning to travel up to upstate wineries, distilleries, and breweries. This was exactly the little taste that I needed to get me in the car! 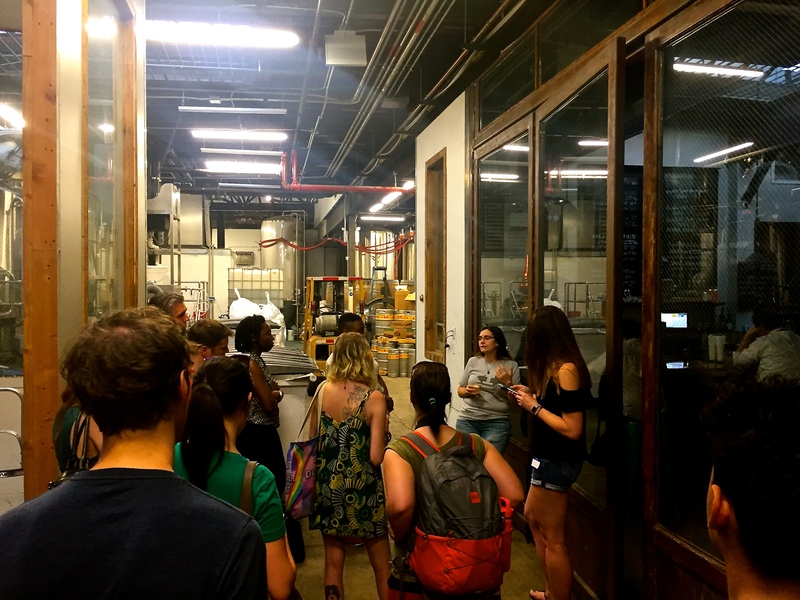 Spending the end of the week with Urban Adventures on their Brooklyn Brewery-Winery-Distillery Tour was the perfect way to kick off what felt like the first taste of summer in NYC. 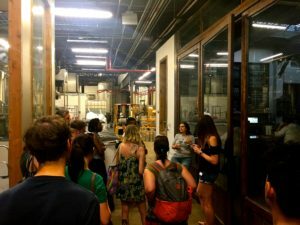 Tour-goers got a crash course on the history of boozing and booze-making in the New York City area, dating back to Prohibition, all the while enjoying some hidden gems of Brooklyn’s own craft beverages. 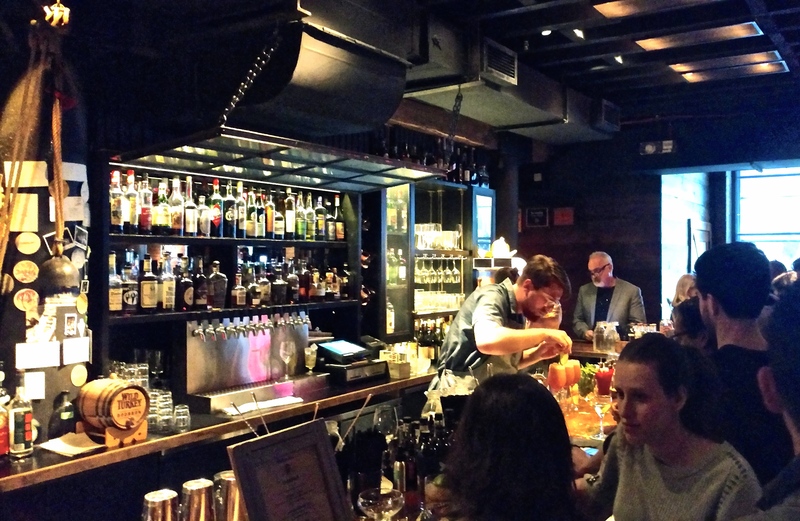 The first stop of the tour was the distillery the Noble Experiment in East Williamsburg / Bushwick. Guests escaped the sweltering temperatures outside and enjoyed a glass of crisp Chardonnay from Brooklyn’s very own rooftop winery, Rooftop Reds. A white blend was poured next, as founder Devin Shomaker spoke about his project and the rooftop’s production. Rooftop Reds is located in the Brooklyn Navy Yard and will welcome its first harvest this October. In the meantime, the rooftop winery hosts a variety of events during which wine aficionados can sample their production of wines created with grapes grown in the Finger Lakes region of Upstate New York. 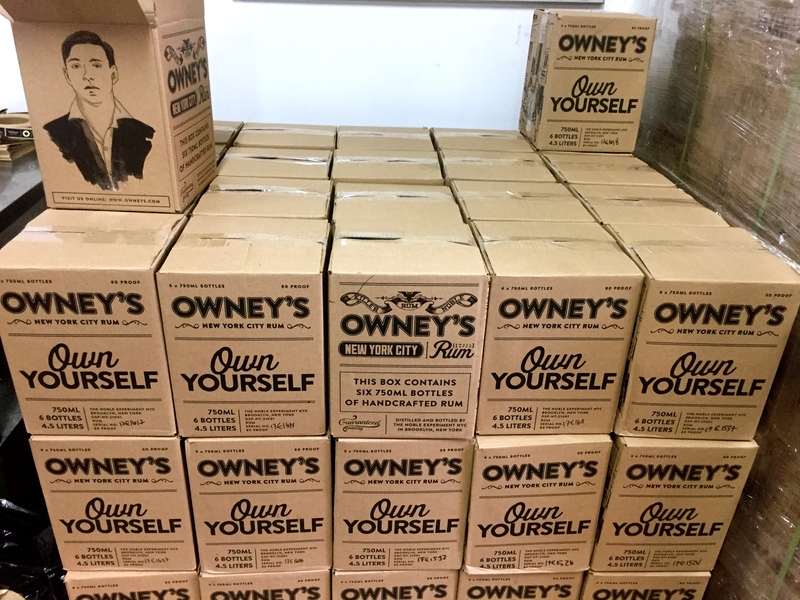 The Noble Experiment is home to the one-woman distillery of Owney’s Rum. With a spacious tasting room in the front and the rum distillery behind a large window in the back, the space is open to tours and tastings of the small-batch rum. Stepping into the distillery, the smell of molasses was strong, as founder Bridget Firtle explained the distilling process. The tour ended back at the tasting room, where visitors imbibed on the white rum (served on the rocks, as suggested by Bridget). Interboro Spirits & Ales was the last stop on the tour. With IPA in hand, guests were welcomed into the distillery side of Interboro for a rundown of the various boozes produced there. 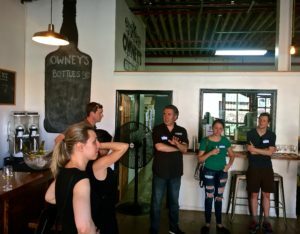 At Interboro’s taproom, visitors can experience nine beers on tap from the brewery, whiskey from the distillery, or their canned gin and tonic made from their own distilled gin. Urban Adventures’ carefully curated tour left attendees wanting for more as the last drops were indulged. With the list of craft beverage producers on their list of organized Brooklyn tours, there are many more left to experience! For more information on upcoming tours and events, visit Urban Adventures.